Over the past year, we’ve given a warm Texas welcome to visitors from near and far. In fact, we’ve made friends from all over the country! 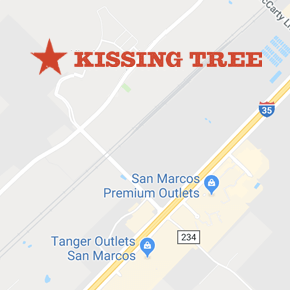 The Petrinos made an impromptu visit to Kissing Tree during their anniversary trip to Austin, where they fell in love with San Marcos’ charm, the Hill Country views and our distinctly Texan community. Watch our favorite Bostonians in action, and see their story unfold.